Many book promoters tell women writers to occasionally blog about food and recipes. The idea is to make us more accessible, more like our readers. It’s part of that “branding” game we’re advised to play. Except for one post a few years ago, I’ve never been much tempted to write about food in my author website. Not that it’s a topic I don’t care about. I used to write about food in the first blog I started in 2010, but that blog mysteriously went AWOL. I’m slowly resurrecting those posts in my new blog Artsy Rambler. Many of those posts were not on cooking but about the food I find in places I’ve traveled. I wrote a series of posts, for instance, on my experience eating and cooking in Paris when I was there for a few months in 2012. Justin (Welcome Reluctant Stranger), like me, is an adventurous foodie. Despite his Polish mother, for instance, he adapts to Leilani’s (the heroine) palate and makes a fusion dish of meatballs with Indonesian peanut sauce on fetuccini. In Hello, My Love (Book 1), his mother Agnieszka serves tagine, a Moroccan dish. She’s also an adventurous foodie. My foray into food in fiction reaches a new height in my latest novel, Sugar and Spice and All Those Lies. Gina , the main character, cooks for a restaurant that serves haute cuisine. In the film Babette’s Feast, based on a story of the same title by Isak Dinesen a highly-gifted chef schooled in cooking as high art escapes war-torn Paris. She finds herself living in gentle servitude to two good and pious but dour, nearly joyless, sisters. With no inkling who Babette is, the sisters instruct her on preparing their diet of long-simmered dried fish. Definitely not cooking as high art and probably offensive to the talented chef. Babette says nothing and does not show off what she knows. Until she wins money in a lottery. She doesn’t take the money to live a little more luxuriously elsewhere. Instead, she spends it on the makings of a feast that she prepares with much care. The feast is an unexpected gift to the people of this cold and gray seaside village. It’s nothing like they had ever known and something they’ll never forget. I have watched this film a few times, mostly for its memorable dinner scene. The expressions and comments of diners show them clearly savoring the dishes, allowing tastes to linger sensuously on their taste buds. No one rushes to gobble up dishes. Instead, diners pause and pay attention. The dishes fill them with wonderment. But the sumptuous dinner does much more than celebrate food’s appeal to the senses. 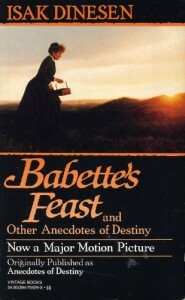 Depending on their orientation, readers/writers have interpreted Babette’s Feast in religious, artistic, or psychological terms (for example, this article by Priscilla Ferguson). At infrequent dinners we’ve had at a local restaurant I find myself replaying the dinner scene in Babette’s Feast. Only, my version of it is more intense and full of happy surprises: Our feast is, after all, real and not vicarious. The menu is inventive and includes uncommon ingredients used in uncommon ways. Once seated, diners have to put their fate in the chefs’ hands. You don’t get a printed menu (you do get one with the bill). You learn what you’ll have next when the server brings and describes each dish. This may intimidate someone who likes to always be in control or isn’t adventurous about food. The whole dinner unfolds in the manner of a full course French menu, You get small servings of amuse bouche, fish and meat courses, palate cleansers and dessert. Each dish is a symphony of flavors, textures, and colors, with unexpected twists and ingredients. For instance, a very light bay leaf mousse spooned over a mélange of variously textured citruses. Or tiny slices of sweet tart red beets on top of melting cauliflower puree. Or a sweet oyster shrouded in sea foam and contrasted with tiny slices of crunchy potatoes. Baby shrimp is fragrant with pea tendrils, chrysanthemum, and rhubarb. All dishes are created from a belief in cooking as high art. Babette has been reincarnated at this restaurant, where chefs treat cooking as high art. It’s the only restaurant in the area with two Michelin stars. Maître Chef James and his staff love what they do. Like all gifted artists passionate about their medium, they push cooking as high as they can take it. My experience at this restaurant has inspired my latest novel, Sugar and Spice and All Those Lies. Les Halles in Paris—do you know it? Unless you’re into a bit of French history, you may not. It doesn’t exist anymore, demolished in 1969/70, its centennial year. 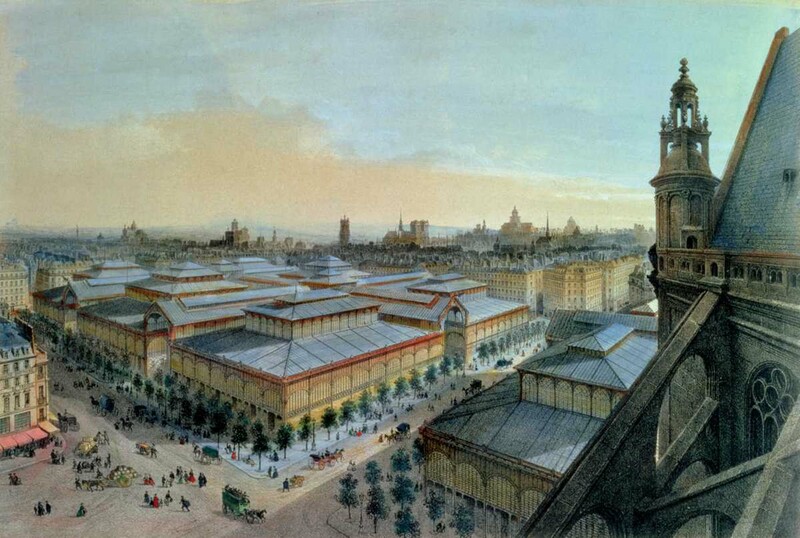 It was a huge market, much of it housed in at least ten pavilions of glass and iron designed by Victor Baltard. Plus a big domed central pavilion that later became the Bourse de Commerce, the French stock exchange. Everything you could imagine to be edible could be found there, from fish, meats, and cheeses to fruits, vegetables, and herbs. 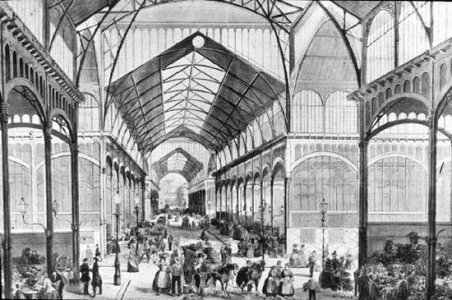 Les Halles has been called the “belly” of Paris, a name owed to Emile Zola’s novel Le Ventre de Paris (The Belly of Paris), published in 1873, three years after the opening of Les Halles. It should be no surprise that the novel contains descriptions of the market’s offerings. Descriptions that are some of the lushest I’ve read and probably in greater profusion than in any other book. For those who love food, it’s a joy to read. Sounds like a psychological study (here’s another of another Victorian character)? Sure does, but in the form of fiction. The cycle or series places various members of this particular family at the core of each of the twenty books. In The Belly of Paris, that Rougon-Macquart is Lisa, the plump and beautiful, rosy, self-assured woman married to Quenu, the owner of a successful charcuterie. While her relatively simple-minded fat husband labors in the kitchen to make the products for the store, La Belle Madame reigns behind the counter. The book, is so much more complex than it may appear on the surface and, like any great piece of art, each reader can potentially see in it something that’s unique to her particular perception. For me, one character that stood out is the young artist Claude, Lisa’s nephew, who returns as the main character in a subsequent book, L’Œuvre (The Masterpiece). He wanders around the markets in early mornings, admires the luscious colors of the produce and imagines painting them. 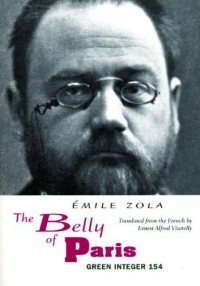 Claude may have been modeled after post-Impressionist Paul Cezanne, Zola’s friend from their childhood in Aix-en-Provence. Besides being a painter, Claude is something of a philosopher—a mouthpiece for Zola—as he theorizes about fat people swallowing up the thin ones. This clash of Fat vs. Thin is, in fact, a major theme throughout the whole book. 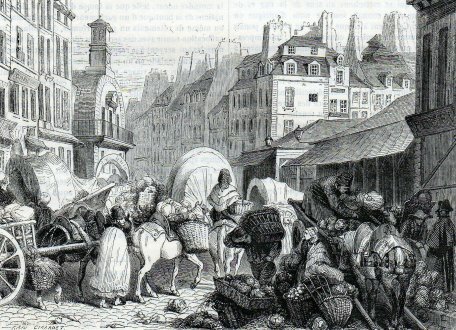 The Belly of Paris is just as much about the characters—as richly-drawn as the produce—that inhabit Les Halles as it is about its life-giving (for the fat) but also nauseating (for the thin) bounty. 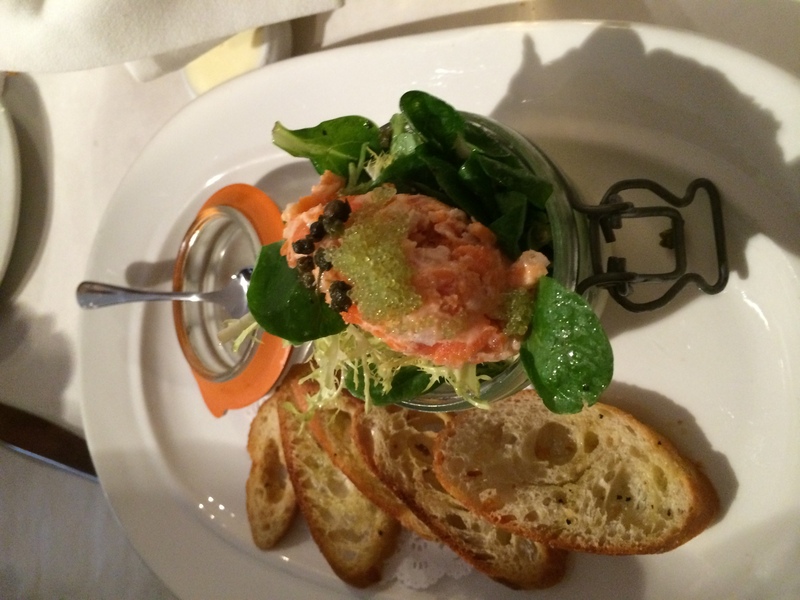 For a long time, French cuisine has been celebrated all over the world for its superior quality and craftsmanship. Every chef worth her salt wanted to master French culinary techniques. French gastronomy has been such an institution that UNESCO declared it an intangible cultural heritage in 2010, citing it as a “social custom aimed at celebrating the most important moments in the lives of individuals and groups.” A ritual and festive event using know-how linked to traditional craftsmanship. 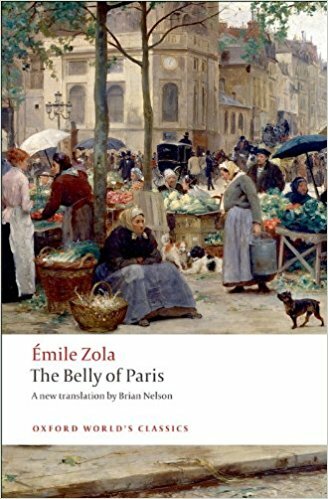 Les Halles, I think, is both at the root of and an embodiment of French gastronomy, one that Emile Zola immortalizes in this sumptuous, biting book. When we first meet Isabel, she is in the prime of her youth—beautiful, irresistible to men (every male character seems to eventually fall in love with her), intelligent, poised, vibrant, hungry for life, and marching to her own drums. She has all the potential to be an exceptional woman. To remove the obstacles of poverty that can hinder realizing that potential, her admiring dying cousin, Ralph, shares half of his inheritance with Isabel who, of course, is unaware that she owes her wealth to him, instead of his father. Ralph believes that with this money, Isabel can do what she wants—marry (or not) as she pleases and live in a style and manner based only on her good judgment. Isabel travels to satisfy her curiosity and to learn about the world in order to grow her mind. After a year or so of travel, she seems to think she has seen and learned enough. She thinks of marriage. She has already rejected the suit of a fine-looking Lord with “radical” views and who is liberal with his tenants—“half of England,” as someone joked. Among the eligible candidates, you get the feeling James might have considered him the best match for her own exceptional characteristics. But Isabel chooses Osmond, a man who looks polished and impeccable on the surface but whose shallowness is evident to many people including her cousin Ralph. Although Isabel, generally values his judgment, she dismisses it in this case because Ralph confesses to being in love with her. Osmond is not rich and not seemingly interested in doing great deeds—someone relatively ordinary. It is a choice that seems out of character for Isabel. Is she afraid to be outshone by Lord Warburton? Does she think he is too good for her? Or, is there simply no physical attraction towards him? In fact, Isabel has been duped into marrying Osmond by her friend, Madame Merle, with whom Osmond had an intimate history. Isabel proves to be naïve enough not to know that charming and worldly but calculating Madame Merle has worked her like a pawn. In this decision—probably the most important one in her life—Isabel appears to have squandered her gifts and exhibited poor judgment. I am actually rather appalled and incredulous to see someone described as having superior attributes prove herself so dense. How is that possible? It seems to me inconsistent, from a psychological perspective. James does not enlighten us too much on Isabel’s choice. Maybe, to him, it is also a puzzle, but he does suggest that by this marriage, Isabel might think herself benevolent by bringing wealth to the man she is marrying. Does she, in fact, feel that she can maintain a certain level of freedom by marrying someone not quite so superior? Will marriage to a nobleman stifle her? Once married, of course, both Madame Merle and Isabel’s chosen one show their true colors. He wants to conquer her spirits in the name of being the all-knowing authoritative husband. She does not take to that kind of treatment well, as we may expect, and a psychologist may say she responds by being passive aggressive. That is, by word and deed, she seems to comply with her husband’s wishes but by failing to produce what he wants of her, she actually undermines them. It is a tug of war, barely disguised. Isabel is profoundly unhappy—again, as we may expect—and her unhappiness is aggravated when she confronts the truth about why her husband married her. And yet, in the end, unhappy as she is, she chooses to suffer because she believes in the sanctity of marriage and considers herself bound to it. Remaining married to this man is looking more like the sacrifice of her life, although in her mind, it may be a heroic and romantic one. To my admittedly more modern view, Isabel is a coward. Not at all what I would expect from someone intelligent, vibrant and with a mind of her own. 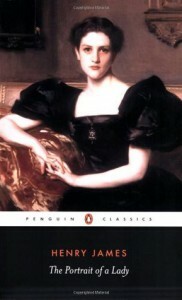 I find it curious that Henry James would title his book The Portrait of a Lady. That definitive article “The” is what bugs me, especially coming from a man who never married and who may not have had lasting relationships with women. Why not A Portrait…?. Surely, Victorian ladies were not all like Isabel Archer. Two of them, in fact, are relatively well-drawn in the novel—Madame Merle and Henrietta Stackpole. Maybe, the point Henry James is trying to make is this: That the real Lady of Victorian times was, in fact, a tragic figure, possessing contradictions that can confound us. She could have wonderful attributes or, at least, wonderful potential, but she could waste them and sacrifice her own happiness in the name of being a lady. She had not known where to turn; but she knew now. There was a very straight path. To me, “a very straight path” embodies the sense in which James thought of Isabel as the lady—one so exquisitely attuned to society’s standards of demeanor that she would follow them at all costs and reject the chance she has to leave a disastrous existence. By dint of personality and/or circumstance, Henrietta Stackpole and Madame Merle could not or did not choose to be so bound with those conventions. So, perhaps, by James’s—and Victorian society’s—definition, neither could have been “the lady”. Victorian novels have heroines with more chutzpah than Isabel. Some of Elizabeth Gaskell’s heroines, for instance. You may argue that they are not in the same privileged class and, therefore not as beholden to conventions. But if you look at real figures, you’ll find some women of the period with feminist leanings, including a few who inherited money. Were they “ladies?” If Isabel Archer was “the portrait of a lady,” then perhaps they were not. Thankfully. Heartache and the specter of revenge follow when sparring partners spend the night together two days before he weds someone else. This modern-day pastiche of Jane Austen and Elizabeth Gaskell novels is an engaging romp into deep powerful love, with a good dose of realism and a twist of mystery. Shadow of the Wind. I’ve puzzled over this title. Technically, a wind would not have a shadow. Or, maybe, it does; but we need a sixth sense to see it. If so, this title is the best anyone could give this novel, although I must confess, I did not feel that way until I got almost towards the end of the book, 358 pages later, to be precise. I found my initially strong interest waning and actually nearly lost about 300 pages into the book. I put it aside and wondered if I’d pick it up again. 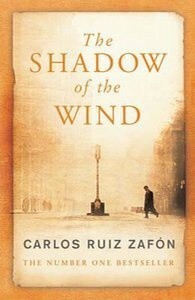 But, there was something about the beginning of the novel by Carlos Ruis Zafon that intrigued me. It hints at a mystery. But more than that, the novel is multi-layered, from the story within a story to the layers of subtext about life, about people, and about books of fiction and our relationship to them. So, I picked it up again. I am glad I did. This novel reminded me once more of the ways in which fiction could be great. And why I read it. This is one of the best I have come across in a long time and yet, I cannot necessarily explain why. Greatness is probably impossible to understand and explain, anyway. If I read it a second time, I’m likely to find something in it I did not see before; or I might interpret the book differently. 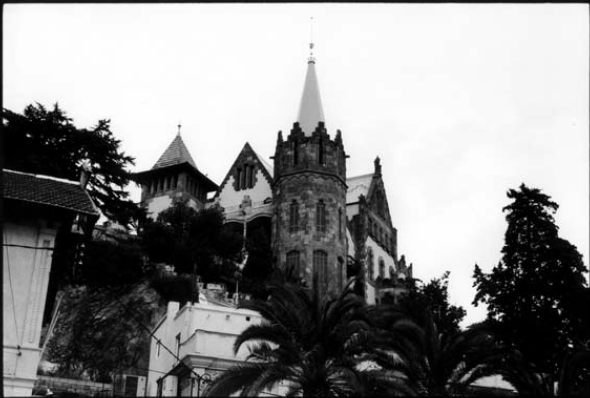 One could see Gothic elements in the story, both in its plotlines—mystery, menace, obsessive romance—and, occasionally, in the style of narration. But, even in its translation to English (from Spanish), that sprinkling of Gothic seems to be thoroughly appropriate to the tale that is told. And it is told, not shown: You do not get a narrative of events as they unfold. What you get are recollections by people the narrator seeks out in his search for truth. This method served me quite well, at first, but it became increasingly frustrating to the point where I found myself reluctant to go back to it after setting it aside for the night. My estrangement from the book lasted for some time. And yet, when I finally did finish reading it, I was awed by how engaging and masterfully written this book was. The story within the story spans several decades from circa 1919 to 1955 and emerges from the quest of the narrator who, as a boy of ten immediately after the second world war, is allowed to choose one, and only one, book from a place called Cemetery of Forgotten Books. He selects Shadow of the Wind by Julian Carax, an unknown author. The choice is not at all fortuitous, as it will turn out. The book so intrigues the boy that he wants to find more books by the same author and, of course, to learn as much as he could about him. (Strikes a chord?) Here is, in fact, where the book begins as a story within a story. This obsession by the youthful narrator continues into adulthood to about ten years later when most of the puzzles he comes across in his quest are understood, if not tied together. The enlightenment begins on page 359 (print copy) with the telling shifted to a female character who knew Julian intimately. Impatient souls might balk at having to wade through so many pages first before the truly exciting part but this is where you begin to feel, in your bones, the greatness in this book. And you might find yourself eagerly devouring the remaining 150-some pages. You also realize why the first 358 pages are important. They present the characters in the story (about Julian) within the story (the quest) of the narrator. Not only are these characters useful devices for the telling, they also work up your anticipation for the remainder of Julian’s tale. But probably more than those reasons, you see the ravages of time on these characters—ravages that, in one form or another, descend upon all of us, if we live long enough. Thus you see: This story within a story is ultimately about time, about how each person’s life spins across it; how events beyond our control can propel lives forward into a miserable existence; how time wreaks its havoc and memories are all we’re left of past time. In those dark wet days in Barcelona, in the shadow of fascism, a civil war, and a world war, misery visits nearly everyone; and time is unkind to them. But this is also a story of hope. Hope that infuses three love stories: Obsessive and tragic between Julian and his Penelope (allusions to Penelope in Homer’s Odyssey? ); fresh and audacious between the young narrator and his Beatriz (allusions, perhaps, to Dante’s Beatrice? ); and mystical and poignant between the author Julian and the narrator. The last connection is the type that occurs between kindred spirits and reveals itself fully to the narrator only towards the end. It invites interpretations of reincarnation; or, maybe, it merely alludes to cycles of life repeated across time. As repeated in the story of the narrator, so like Julian’s. As it may be when the narrator’s story comes to a full turn and he takes his son to the Cemetery of Forgotten Books. About three months ago, I got a copy of The Wedding Group by Elizabeth Taylor. No, not that Elizabeth Taylor. The other Elizabeth Taylor. These are a couple of published reactions when articles are written about that other Elizabeth, a British writer in the mid-1900s. Unfortunately, that shared name may be one big reason so many people have not heard of her. I, for instance, only discovered her, as I was googling for writers who write like Jane Austen. Yes, she has been called the Jane Austen of the 50s and 60s by at least one other British novelist (award-winning Anita Brookner). I imagine she’s earned that comparison for her preoccupation with the ordinary domestic lives of the British middle class of her time, as well as for her incisive vision. The Quayne ladies, adjusting their mantillas, hurried across the courtyard to the chapel. The Quaynes were a closely-knit family of Catholics, whose women went to church regularly. The Quayne ladies, observing the traditional custom of wearing veils, hurried across the courtyard to the chapel. While this second version conveys what Ms. Taylor writes in her one sentence, her construction is arguably more graceful and pithy. Besides, it does more showing than telling and also exemplifies what Francine Prose calls energetic, specific (I would add “efficient”) use of language. I also think the choice of the word mantillas (from which I infer “Catholic”) is quite extraordinary. It is more evocative than veil, suggesting exoticism and grace. Nothing truly sensational happens in this story about a Quayne daughter who attempts to escape the constricting atmosphere of her family and its tyrannical patriarch. It is a sort of coming of age, but you never feel that this young woman really matures. She does change, within her own limitations.